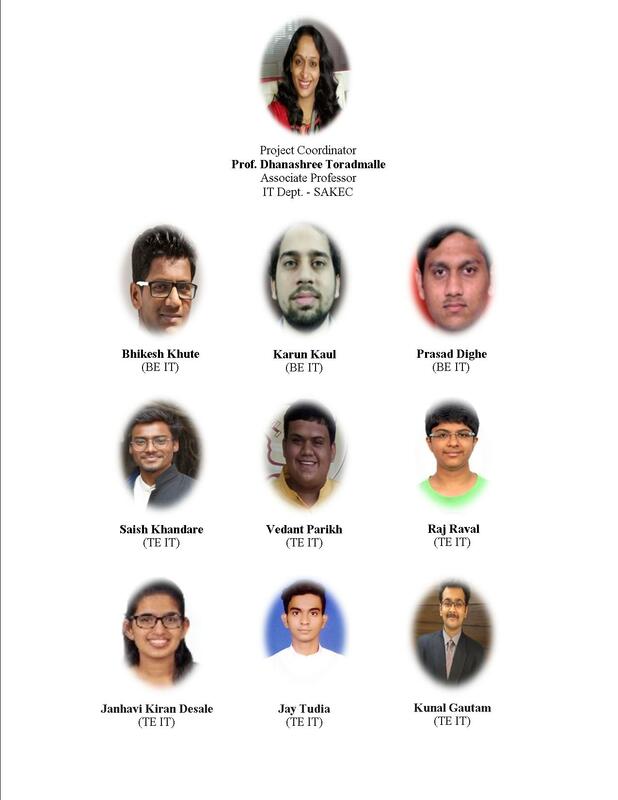 Initiative of SAKEC Research Cell to nurture Technical Eminence and Leadership Qualities in students is appreciated by collaborating organisations. There testimonials are source of inspiration to work ahead enthusiastically. 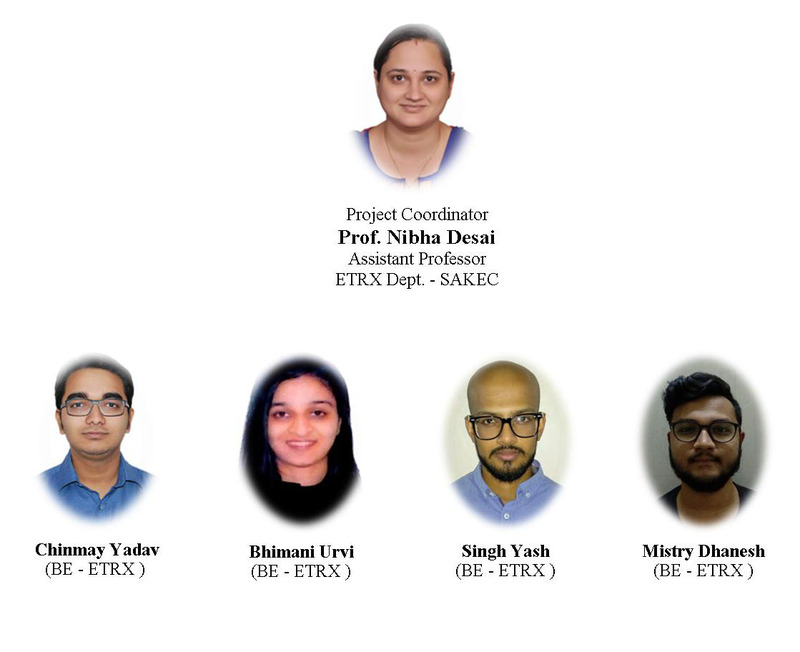 SAKEC Research Cell has been undertaking consistent efforts to align our R&D activities to achieve technological competence and professional standards. 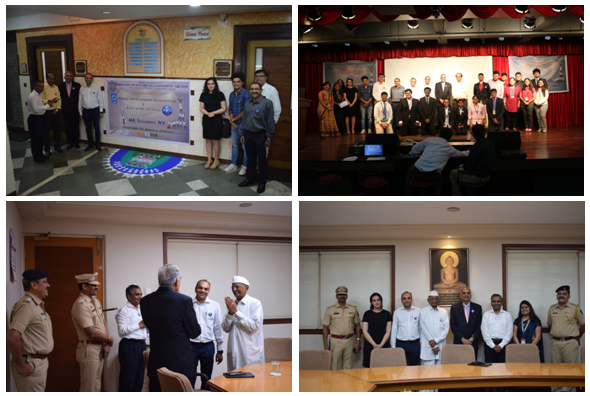 SAKEC Research Cell has collaborated with various organisations like Indian Development Foundation (IDF), RotiBank Mumbai and Bombay Leprosy Project (BLP). MoUs were signed under the banner “Me becomes We – Together to build a strong Nation”. 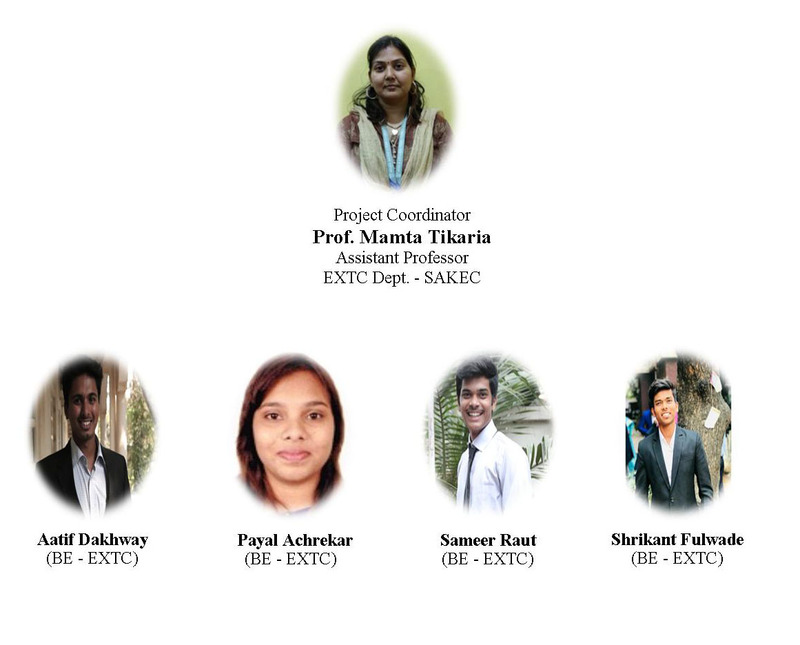 Students and faculties of SAKEC got opportunities to work on real time projects with social cause. 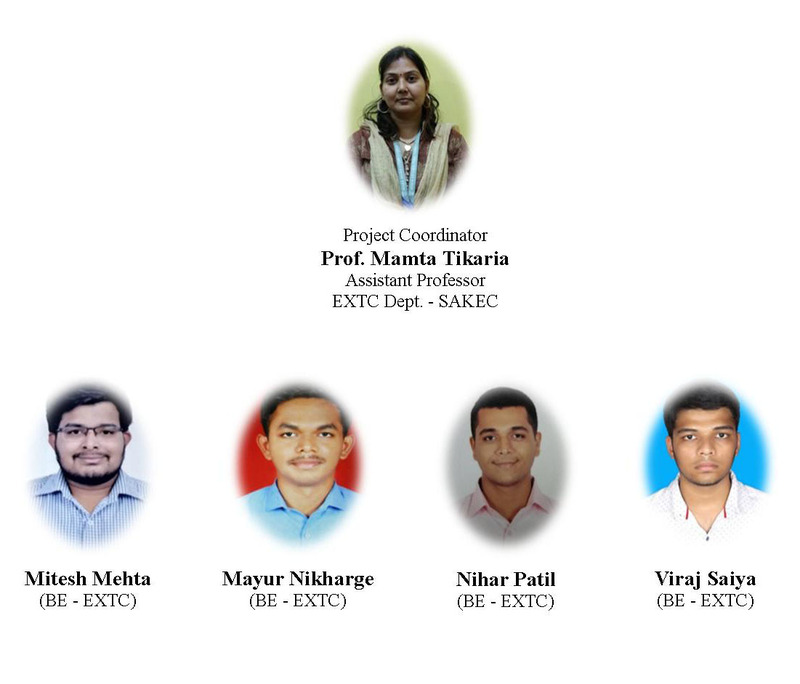 SAKEC Research Cell strives towards the Vision and Mission of our institute. We at SAKEC have been undertaking consistent efforts to align our R&D activities to achieve technological competence and professional standards. The faculty and students undertake research projects in thriving areas of science, engineering, management and technology. Many of our projects offer opportunities in fundamental research that are focused to tackle live problems. The projects under the banner of SAKEC Research Cell work for the benefit of industry and society. We have established partnerships & are looking forward towards more such collaborations with some NGOs, Universities and Industries. To encourage multi-disciplinary research, internally within the institute and externally, with other organizations. To encourage interaction with industry and NGO’s working for societal benefits. Review and recommend the project proposals and assist them to agencies for financial support. To encourage students and faculties to form research/innovation councils that will work under guidance of technical professionals and financial experts for delivery of a product. Event Date 3rd July 2018 Click here for more details..
“Leaders in Action – Celebration of Inspiration, Knowledge and Giving”, event was organized to commemorate the 90th birthday celebrations of Dr. ARK Pillai, Founder of Indian Development Foundation (IDF) on Tuesday, 3rd of July 2018 at Shri Shanmukhananda Fine Arts & Sangeetha Sabha, Mumbai. Many faculties and students of SAKEC attended the event and got motivated by Leaders. Event Date 4th August 2018 Click here for more details.. 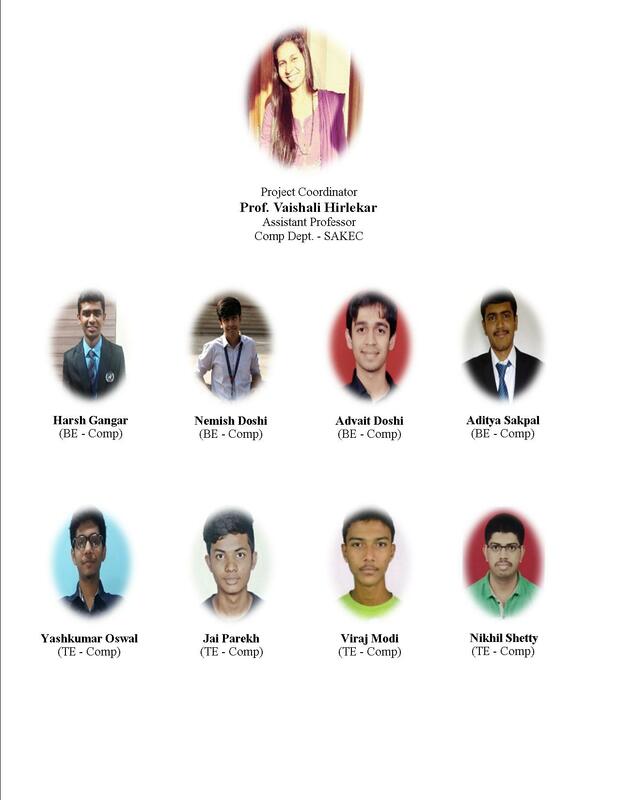 Event Date 19th September 2018 Click here for more details..
“Student Leadership Program by Indian Development Foundation” was conducted on 19th September 2018 at SAKEC under the umbrella of “ME becomes WE – together to build a strong Nation”. We had excellent speakers, Ms Mallika Ramchandran and Mr.Roshan D’souza from Indian Development Foundation who are experienced SLP co-ordinators. 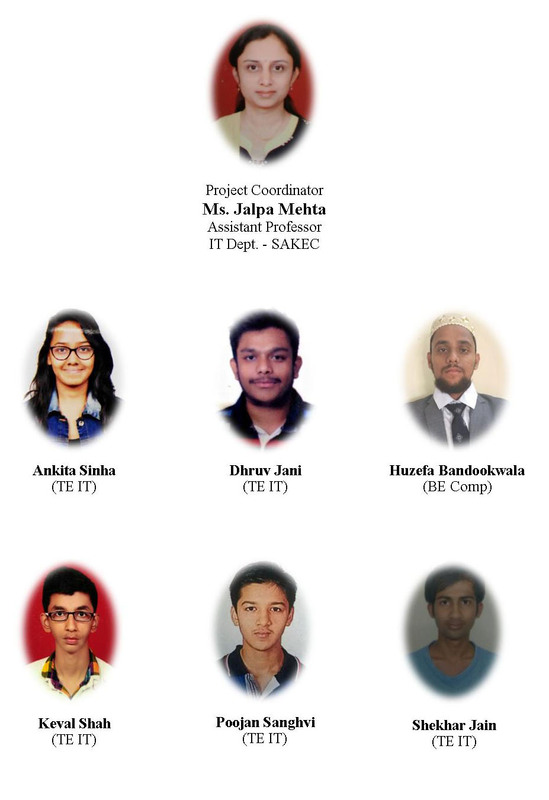 The co-ordinators conducted the session for SAKEC students on how they can become mentors and help nation in achieving their goal of teaching the underprivileged children. 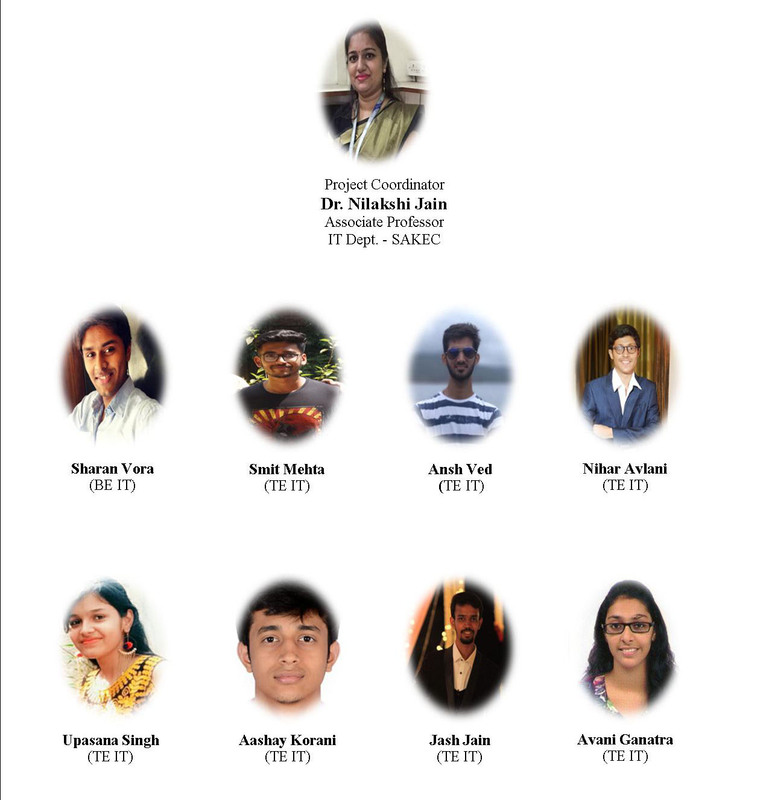 The session was truly inspiring as the students were looking forward to get real time exposure of mentoring.The speakers also assured the students that this would be a life-changing experience for them to give back to the society and lead a successful, satisfying and happy life in true sense. The session was appreciated by the students who thanked the speakers as well as college and faculty for conducting such a diverse session for them. Speakers were given positive assurance about SAKEC’s collaboration with IDF which will bear sweet results to build a strong society and Nation. 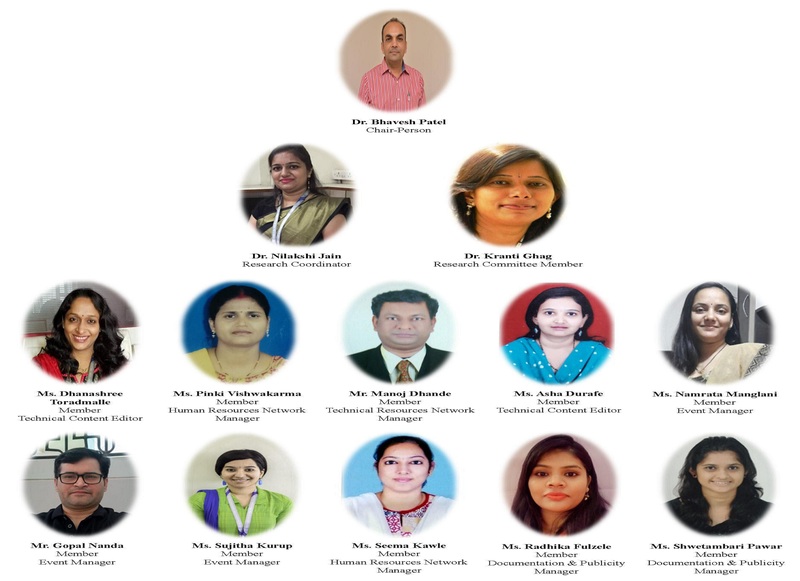 Event Date 26th October 2018 Click here for more details..
SAKEC staff members Prof. Dhanashree Toradmalle., Prof. Manoj Dhande, Dr. Nilakshi Jain, Prof. Bhakti Sonawane, Prof. Manisha Mane, Prof. Nibha Desai, Prof. Aparajita Bera, Prof. Seema Kawale and Prof. Radhika Fulzele along with many students enjoyed the moment of giving. We are developing a system to build a bridge between FOOD and HUNGER. To integrate technology to benefit humanity. Overview of Project The initiative, called ‘Roti Bank’, collects leftovers from restaurants, clubs and parties in Mumbai, stores it in vans and distributes it to the poor before the food gets stale. Launched by Maharashtra’s former Director General of Police D Sivanandan on 23rd December 2017 in collaboration with the Mumbai’s famous tiffin carriers ‘Dabbawalas’, the ‘Roti Bank’ claims to be getting a good response. To make sure the time required by the ambulance to reach the patient from the hospital and back is minimal by providing it the fastest route available. To provide live location of the ambulance to traffic police, hospital and the patient. To connect the ambulance if stuck in traffic with the nearest traffic police. Overview of Project Speed Ambulance will be used in India to ensure the time spent by the ambulance in transporting the patient is reduced significantly thereby saving lives. If an ambulance is stuck in traffic it’s location will be sent to the nearest traffic police available in the vicinity to help the ambulance to navigate through the traffic. The live location of the ambulance will be available to the patient’s family as well as the hospital authorities to track it and monitor the time lapse. In addition to that the ambulance can also capture the number plate of the car which is not making way for it. We are using sensors to test the quality of food. To overcome challenges of developing a standard of food freshness for fulfilling social responsibility. Overview of Project The initiative, called ‘Roti Bank’, collects leftovers from restaurants, clubs and parties in Mumbai, stores it in vans and distributes it to the poor before the food gets stale. We at Shah & Anchor Kutchhi Engineering College are using sensors to test the quality of food for the Rotibank Mumbai. The following sensors are used to test food. We are designing a system which will monitor the air quality data, analyse it and send an alert to the concern authority for necessary action. To develop improved integrated tools for prediction of air pollution in mega cities. Overview of Project Air is essential to life. Poor air quality threatens the health of all living things from humans to plants. There are many types of air pollution, and each have a different effect on human health. People experience a wide range of health effects from being exposed to air pollution so theree is a need to design a system which will monitor the air quality data, analyse it and send an alert to the concern authority for necessary action. To collect the air quality data one can design a system which contains a suitable micro-controller that reads the values from different sensors like MQ-2, MQ-7, MQ-135, LM35 and sound sensors. The microcontroller board is also attached to the Wi-Fi module which acts as a wireless medium to transmit data. The transmitted data then send to the cloud periodically which can be analysed and displayed on website in graphical manner. 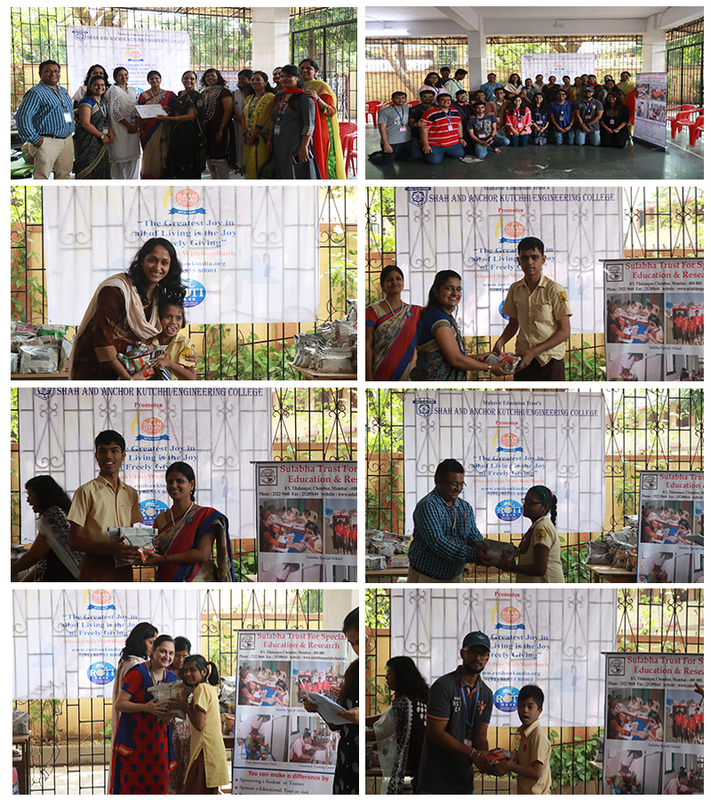 The “ME BECOMES WE“ Event held on 4th Aug 2018, put its stamp on the collaboration of Shah & Anchor Kutchhi Engineering College with IDF Mumbai. Overview of Project Safety and speed are two of the most important aspects of any rescue operation. When a building or an area is subject to a fire, it can be very dangerous for any of the rescuing parties to assess the situation themselves without being subject to harm. A great alternative to this would be to use robots. Thus the problem by definition is being able to locate and extinguish a fire with minimal assistance of human beings and as fast as possible using a robot. This is to reduce the likelihood of anyone being injured as well as increase the promptness of putting out the fire due to the fact that a robot should not be affected by issues such as smoke or lack of oxygen. We are developing a website and volunteer management system to build a bridge between IDF coordinators and volunteers. To integrate technology to ease volunteer management. To migrate the present record keeping system at BLP from hand written paper based forms to a digital database. Carry out health care data management and analysis; and long term follow-up of leprosy patients who default from treatment. Overview of Project Bombay Leprosy Project(BLP) is an NGO which deals with patients having Leprosy, They have a team of volunteers and Doctors who find and treat people having Leprosy. Leprosy is one of the oldest diseases known to mankind and India has the maximum number of leprosy cases in the world. The objective of the NGO is to eradicate leprosy from India. The system/App will manage patient’s history by providing smart cards. It will provide comprehensive management of leprosy patients at referral center and clinics in major government, municipal and private hospitals. The Health records system will be deployed at Bombay Leprosy Project office. The system /App will track the defaulter leprosy patients who failed to follow up at various center. It allows users to report issues they face at leprosy facilities, and maps leprosy facilities centers available near a user’s location. Users will also be able to track issues they have reported and raise follow-up queries. 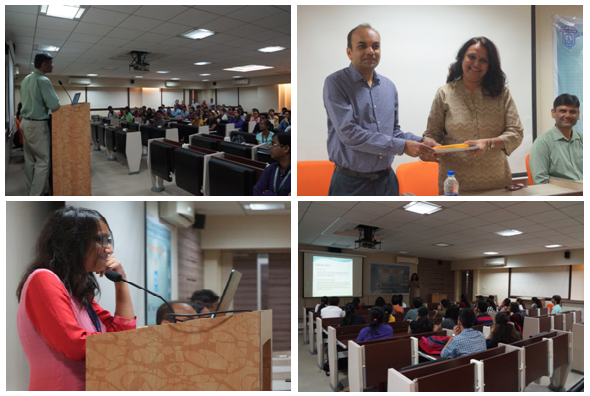 AI and Deep Learning workshop was conducted by resource persons from Bennett University. The workshop aimed redefining the way computing is being used to solve societal problems. Following faculties attended the workshop. All four faculties successfully completed the test conducted in the workshop. Faculties who had attended workshop conducted a workshop for SAKEC faculties and students Diving into Deep Learning Workshop. Research Cell announced ” Special Interest Group on AI & Deep Learning ” under the umbrella of ME becomes WE: Together to build a Strong Nation. Astonishing result of the online quiz and Positive Feedback of ” Diving into Deep Learning ” workshop conducted on 1st and 2nd September of 2018 has inspired us to take this journey ahead. The main objective is to develop Industry ready projects in the said fields. 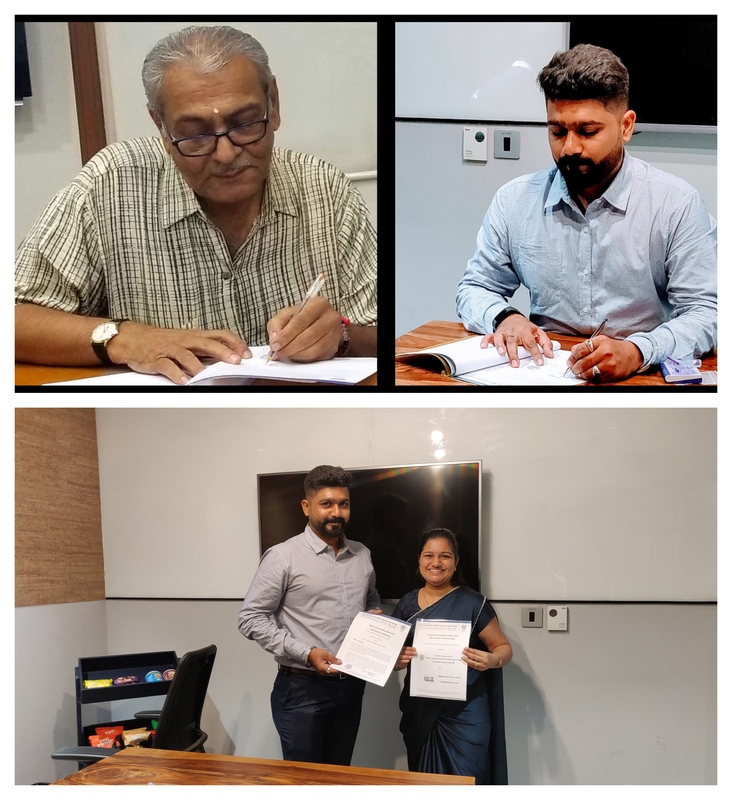 Student Social Responsibility (SSR) Memorandum of Understanding : This Memorandum of Understanding (MoU) is between Indian Development Foundation (IDF- formerly Indian Leprosy Foundation Non-Government Organization) and Shah & Anchor Kutchhi Engineering College (SAKEC). This MoU encourages participation of students in Social Responsibility Projects. College is engaging in-joint research with IDF, in selected areas of interest to both the parties. Faculty members or students involved in such research are encouraged to write real time problem statements.The project implementation needs to be designed keeping in mind the social impact, social responsibility & ethics. The deployed projects should benefit both the parties’ viz. the IDF and the Institute. Deep Learning, Machine Learning and Artificial intelligence are increasingly becoming the must-have skills for faculty, students and researchers in different engineering domains. The Institute has collaborated with Bennett University, which has a great supercomputing infrastructure and accomplished faculty, which will of high value for this engagement. Faculty will get trained on futuristic technologies which in turn will help us to train our students. 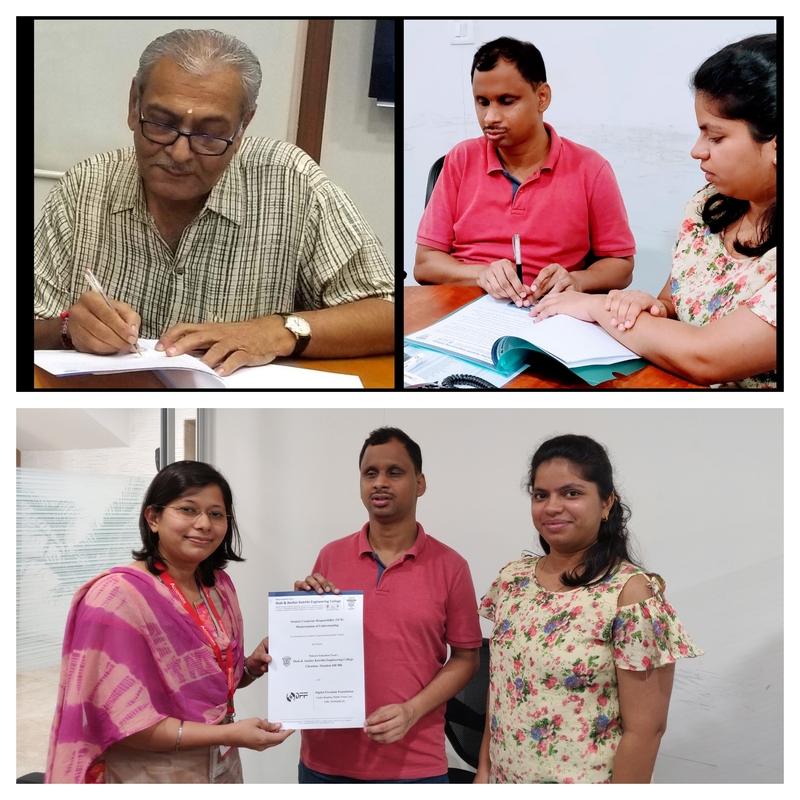 Student Social Responsibility (SSR) Memorandum of Understanding : This Memorandum of Understanding (MoU) is between Roti Bank Mumbai [ Reg: E34021(M)] and Shah & Anchor Kutchhi Engineering College (SAKEC). 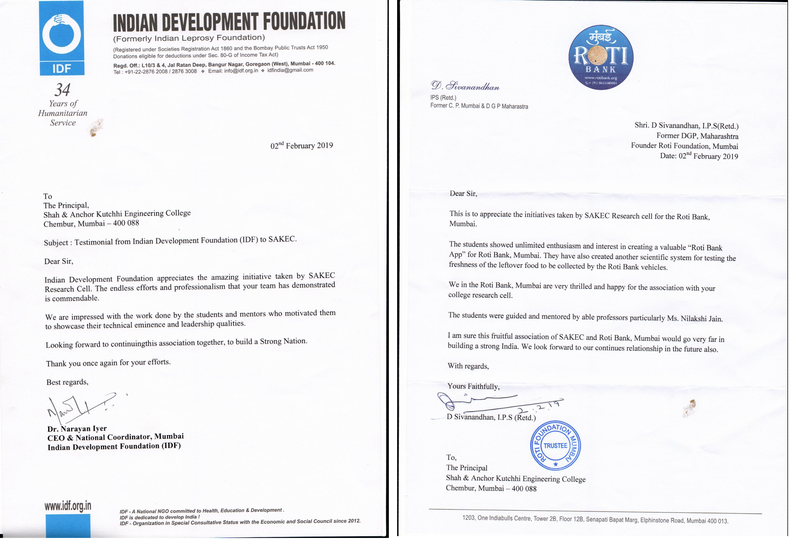 Shah & Anchor Kutchhi Engineering College is engage in joint research with ROTI BANK MUMBAI, in selected areas of interest to both parties. Faculty members or students involved in such research shall be encouraged to write problem statements and project implementation or research results jointly and deploy the project or research outcome for social benefits and both institutes’ benefits. The college shall allocate an officer in charge who shall act as a point of contact with ROTI BANK MUMBAI. Allocating students for involvement in projects and other volunteering activities. Monitor the duration of social work that volunteers may undertake and create time table for deputing the students on a mutually agreed schedule. 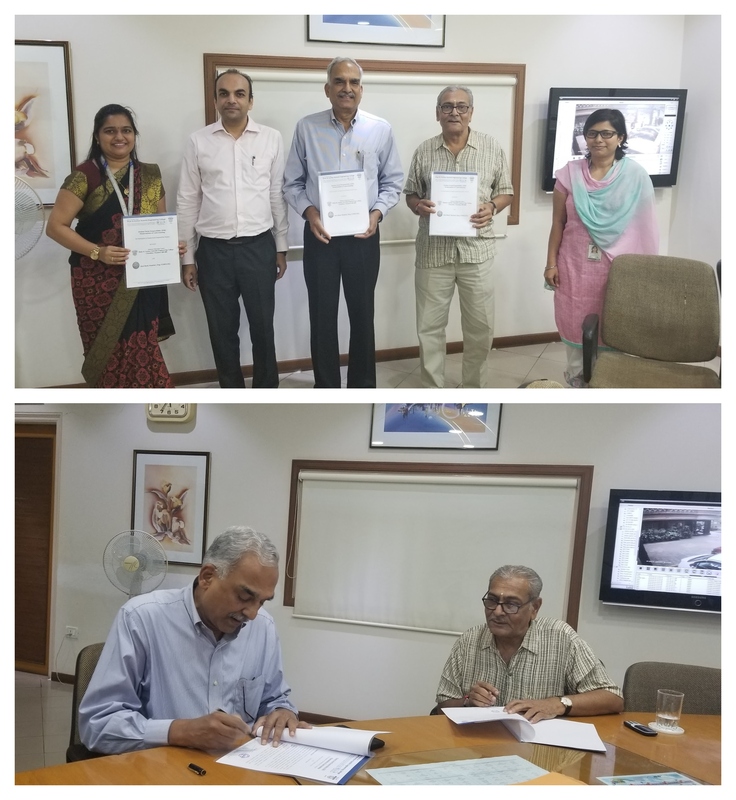 Memorandum of Understanding This Memorandum of Understanding (MoU) is between Waggy Tails Private Limited and Shah & Anchor Kutchhi Engineering College (SAKEC). SAKEC shall engage in joint operational research with WAGGY TAILS PRIVATE LIMITED, in selected areas of interest to both organizations. Faculty members or students involved in such research shall be encouraged to write problem statements. The project implementation of these problem statements will be beneficial to the organization. This Memorandum of Understanding (MoU) is between Digital Freedom Foundation (DFF) And Shah & Anchor Kutchhi Engineering College (SAKEC). SAKEC shall engage in joint operational research with DFF, in selected areas of interest to both organizations. Faculty members or students involved in such research shall be encouraged to write problem statements. The project implementation of these problem statements will be beneficial to the organization.